Cast iron refers to ferrous metal that contains more than 2% of carbon and can be sorted into ductile cast iron and gray cast iron. Ductile cast iron is commonly used in automobile and machinery components which require high resistance to heat and corrosion. Ductile cast iron is known for damage on cutting edge due to chipping on the rake and flank surface of an insert, or welding, more frequently than gray cast iron, it’s spheroidal carbide contains silicon(Si) and magnesium(Mg) easily causing built-up edges between the tool and chips. Moreover it is prone to age hardening, the hardness of a cast iron workpiece increases at room temperature, or unstable tool life according to seasons. In contrast, gray cast iron is an acicular carbide readily cutting chips and causing less built-up edges than ductile cast iron. 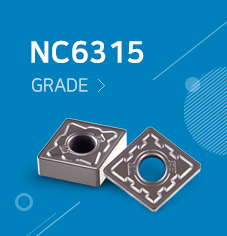 NC6315 is a K15 grade with largely enhanced resistance to chipping and wear in high feed and highly interrupted machining of ductile cast iron and gray cast iron. It secures stable antifracture capability even with highly interrupted cast iron materials and with severe vibrations, making good use of the combination of a universal grade and new CVD coated layers. MK chip breaker improves cutting performance and reduces cutting load during cast iron machining, leading to higher wear resistance and quality surface finish at high speed and continuous cutting. A wide supporting area was designed for solving unexpected tool breakage and edge chipping due to vibrations during machining, improving stability. RK chip breaker features wide lands and supporting area that provide excellent toughness and fracture resistance under high cutting force such as high depth of cuts or high interruption. Its land was engineered to optimize edge toughness and cutting performance, and achieve stable tool life and higher chipping resistance for high feed applications. The combination of MK / RK chip breakers and NC6315 answers your needs for higher productivity and high quality results.